One of the biggest sources of confusion about the Liberal decision to buy 18 Super Hornets is that it is an interim buy. What does that mean? It means that the planes are only being bought to cover a specific period of time--whenever they arrive to whenever the next batch of planes is ready to go. And then the government of Canada is obligated to, yes, get rid of the planes. In 2030 or 2032 or whenever the planes that win the next competition (in five years*, maybe) are deployed, the Super Hornets must be sold, given away, or perhaps even destroyed. I was told by someone in government who reached out to me to explain the decision that the idea would be to fly the heck out of these 18 planes, using them up, but the reality is that is unlikely to happen. Instead, what is likely to happen is that Canada is going to spend a lot on 18 planes that it will then have to find a buyer for after flying them for 12-15 years. It means that the planes are only being bought to cover a specific period of time--whenever they arrive to whenever the next batch of planes is ready to go. And then the government of Canada is obligated to, yes, get rid of the planes. In 2030 or 2032 or whenever the planes that win the next competition (in five years*, maybe) are deployed, the Super Hornets must be sold, given away, or perhaps even destroyed. I was told by someone in government that the idea would be to fly the heck out of these 18 planes, using them up, but the reality is that is unlikely to happen. Instead, what is likely to happen is that Canada is going to spend a lot on 18 planes that it will then have to find a buyer for after flying them for 12-15 years. The aspect getting far more play is this capability gap that justifies the purchase of the Super Hornets--that Canada can't do what it wants to do with the 77 it has or smaller number as planes crash (which, unfortunately, happened this week) or become too stressed to fly anymore. The gap has been "created" by a change in policy--that the Liberals want the RCAF to have enough planes to protect Canada to the highest level of activity (its complete commitment to NORAD) and to meet its NATO commitment. The government of 2014 released a document, the Mixed Fleet report (as part of the Seven Point Plan which has since disappeared from the web mutil my reposting today), which suggests that the magic number is .... 42. Nope, 84. Nope, 90 something. The idea is that if a NORAD crisis and a NATO crisis happened at the same time, Canada would need 36 planes in the air in Canada and 6 over wherever NATO needs them. But to generate 42 planes, one needs twice that due to servicing/maintenance/etc. But 84 is not enough since planes, again alas, crash. So, the 77+18 makes sense IF the government wants to have the ability to fight at home and abroad at the same time. Is this a reasonable standard? 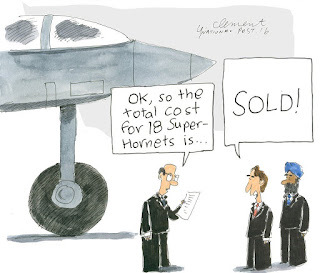 Sure, although if it was applied the Navy, well, oh my (oh, this decision to buy temp Super Hornets and then a full buy of the next generation of planes means that the Liberal promise to save money on planes to use to pay for the ships has now been overcome by events). Is it a political decision? Hells yes--just as war is politics by other means, defence planning is, duh, political. Any allocation of public money is political as are any decisions about how best to defend a country. But to call it that is silly since the decision to have only enough planes to do one at a time was also a political decision. The magic 65 number for the Conservative F-35 plan was certainly derived by looking at the budget and divided by cost to get 65 and not an assessment to get the right number of planes for what Canada needs. The more problematic aspect of this decision is that it happens during the Defence Review, which is supposed to set the course for Canada's procurement down the road. Perhaps the draft within the government was a sufficient basis to make this decision. Perhaps not. I have no idea. * Five years? I questioned that in an earlier post. I said a competition could be done in a year. Perhaps not, as my various sources suggest it would take more than a year. But five? That is still a heap of time, more than is probably necessary. Thus far, the only defenders of this stance are those in government. 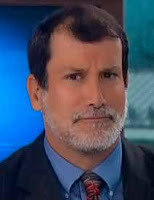 The experts outside of government range from being puzzled to being baffled to being confused to being angry. All I know is that the interim nature of the decision is not getting enough play. NATO Workshop Report: Can We Panic Now? Secretary of State Bolton? Guiliani? What Next? Voice, Not Exit. Ignorant Critic or Informed Overseer?